FIXD Car Health Monitor: Instantly translates your car’s problems! If you have a car, you know that it’s expensive to maintain and repair. And you and I both dread the moment when the damn engine check light turns on on our dashboard. Because it means a detour to the mechanics, at least to check if it’s nothing serious. But what if you could prevent these costly trips to the auto shop? What if you could understand your car, thanks to a tiny device? There are many FIXD reviews but in this one, you’ll read a comprehensive review of this revolutionary OBD2 scanner. And I hope you’ll find it helpful among all the other FIXD reviews out there. FIXD car diagnostic is the result of a successful Kickstarter campaign launched in 2014. And it’s not only a little device you can plug in the OBD-II port of your vehicle. Indeed, it comes with the app which will help you understand your car. And both communicate through Bluetooth. But let’s go back to the basics: What is OBD? It stands for On-board diagnostics. And it’s a vehicle’s self-diagnostic and reporting capability. Car makers have introduced OBD in the early 1980s. And today, all cars come equipped with a standardized digital communications port which provides real-time data and diagnostic trouble codes (DTCs). While you can see only the check engine light on your dashboard, OBD2 car scanner allows mechanics to rapidly identify and remedy malfunctions within vehicles. So when you bring your car to the mechanics, they’ll plug their diagnostic tool. And they’ll be able to see a detailed report on your car, with a list of all problems. Basically, FIXD car health monitor allows you to access the OBD yourself. And within seconds you can know what’s going on with your car, with a simple description of each problem. So even if you don’t speak car, you’ll get it easily. While it can’t detect any car problem, it can detect check engine lights. And its database includes 6,800 possible causes which ones it can detect and translate for you. Finally, and it’s the little thing that could convince you to buy it: You can clear the engine light! It’s like a nifty check engine light app. Of course, this OBD2 scanner won’t fix any problem with your car. For this, you need to visit a mechanic. But you can easily get rid of this annoying light. The first section of my FIXD car health monitor review, the cost. So how much do you have to spend on this car health monitor? 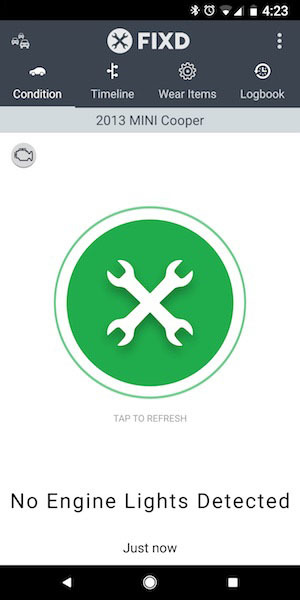 The mobile car diagnostic app is free on both the App Store and the Play Store. And the device costs 59 USD (about £42), which is affordable for this kind of features. Because you could literally save hundred quid in auto repairs. Furthermore, if you need one or two extra devices for your other cars (your family’s), you can get a discount. While the second one is 50% off, you can get the third one for free! And you can try this device risk-free with their 30-day money-back guarantee. Lastly, each device comes with a 1-year limited warranty. Not all FIXD reviews will give you a special deal, but this one will. Simply click the ‘Get it Now’ button to avail. You can keep the FIXD car health monitor plugged in at all times. And you’ll get notifications on your smartphone if it detects a problem with your vehicle. While it charges with your battery’s power, it uses a low-energy mode. However, if you need to leave your car sitting for more than a couple weeks, you should remove the sensor from your OBD-II port. As I said above, you can order several of this car check app – one for each car you have. And you can remotely monitor the health and status of those vehicles from the same car diagnostic app. 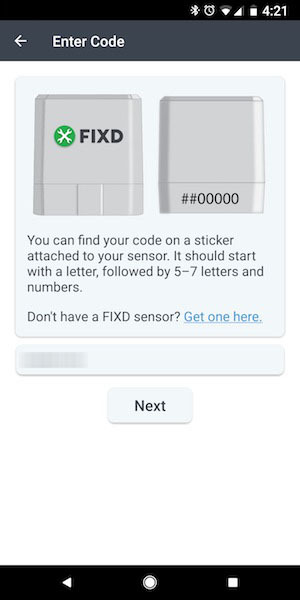 Also, each family member can download the FIXD app to access the live data of their car. With the sensor plugged in, this car monitor can determine your mileage, using an algorithm their team developed. And FIXD car health monitor can send you an alert when your vehicle approaches the next recommended maintenance. Maintaining your car properly can save you money in the long run! Having a real-time feed of your car’s health and issues is nice. But it’s even better if you can track all the problems. Because you may discover a recurring issue, who knows? That’s why you can get the history of problems detected in your vehicle and keep a running log using FIXD car health monitor. When you receive the tool, it’s in a very nice packaging that will remind you of Apple products, really. And the device in itself is a white sturdy piece of technology, which reminds me of the old Euro-AV connector for my PlayStation 2. Is FIXD car diagnostic compatible with your car? Chances are it is. Because this OBD2 scanner works with all gas, diesel and hybrid cars from 2006 and newer. And it can connect to any vehicle model year 1996 and newer that runs on gasoline. Finally, it also works with trucks model year 2006 and newer which have a gross vehicle weight rating (GVWR) under 3,500 kg. How to use FIXD car health monitor? Simple as pie! I’ve prepared below a quick step-by-step tutorial to help you get started with ease. And if you have any question, feel free to contact their support team. That’s it! From now on you can monitor the health of your vehicle. And if something’s wrong, you’ll get a notification. The company developed native apps for Android and iOS. 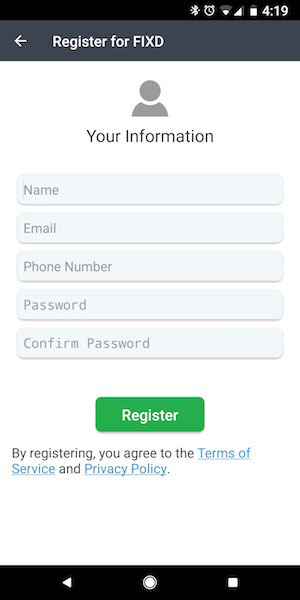 So you can download and install the FIXD app either on your smartphone or your tablet. And they’ve done a good job with the User Interface (UI). Everything’s neat and smooth. And you’ll know what to do without the need for guidelines. If you’ve ever felt being ripped off by mechanics, then this is the solution you’re looking for. Because this OBD2 scanner will allow you to understand what your car is telling you when the check engine light turns on. In addition to displaying the error codes, it assesses and tells you how bad the problems really are. So you won’t have any bad surprise when you bring your car for a routine oil change or feel frustrated because you feel like you don’t know how to fix a car. It’s a very accurate car diagnostic tool. Indeed, mechanics use the same data, from the same port (OBD-II), to diagnose your vehicle’s health. So you’ll be able to call B.S. on the shady auto mechanics from now on. Last but not least, anyone can use it. You’ll find the port in less than a minute, install the car diagnostic app and get a diagnostic in a few more. And you don’t have to be a car person. Because the app translates problems into simple terms. Does it work? Yes! And my review, like most FIXD reviews out there, is very positive. For me, it’s the best car helth monitor out there. FIXD active car health monitor review: Essential! Product Description : While it will never replace good mechanics, FIXD car monitor is the perfect OBD2 scanner to monitor your car's health. It allows users to really know what's going on under the hood of their vehicle. And to assess how bad it is. One could almost wonder why a car diagnostic app is not available by default in cars. Doesn't actually fix your car!